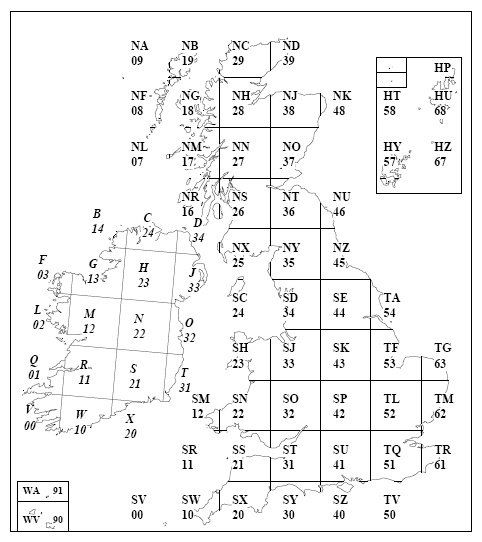 The Gilbert 21 software uses a place name database - called a gazetteer - to suggest place names for any grid reference entered for a record. When you first create an empty database, the gazetteer is has no names in it. To get Gilbert 21 to suggest place names for you, you must first load the gazetteer database with place names from one or more of the gazetteer files which you can download from this page. The most basic gazetteer - covering the whole of the UK - which you should always load - is one derived from a publicly available OS 1:50,000 gazetteer. Use the procedure described above to download the zip file below and read it into your Gilbert 21 gazetteer database. Although the os50kgaz gazetteer file contains place names for all over Britain, it doesn't have a great deal of local detail. So there are also a number of other gazetteer files that you can download with many more local names in them. These are derived from a free OS product called OS VectorMap District. They are organised in files which each correspond to a 100 km square of the OS national grid (see below). Look at the map to see what 100 km squares you are interested in. For example, if you live in Merseyside, you will probably want to load the gazetteer files corresponding to 100 km squares SD and SJ. Download the gazetteer files by clicking the links on the right and follow the procedures described above to install them.